If a Dog Attacks, Remember These Tips! - Something New Everyday! Home GoodToKnow If a Dog Attacks, Remember These Tips! If a Dog Attacks, Remember These Tips! Imagine that you’re enjoying a peaceful jog in the park or a nice bike ride through the neighborhood when, suddenly, an aggressive and unfamiliar dog runs up to you, growls and snarls, and primes himself to lunge. What should you do? 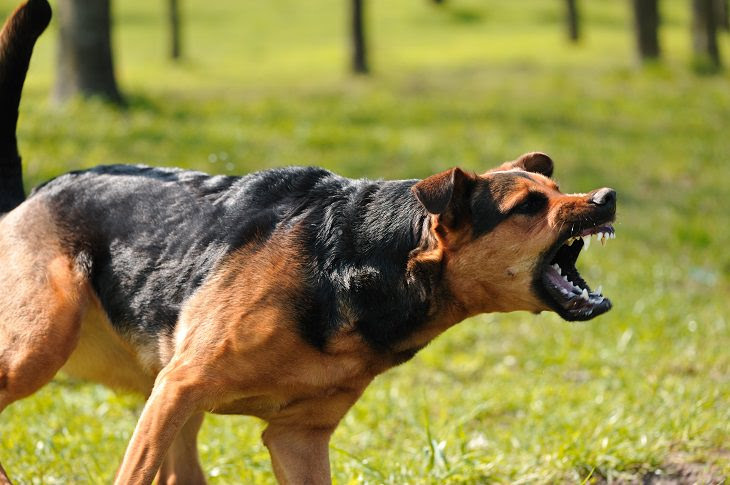 There’s a correct and wrong way to handle an encounter with an aggressive dog and we’re going to explain this in detail below as it’s very important to know what you should do in the unlikely event of a dog attack. There is some truth to the adage that states that dogs and other animals can “sense fear.” If you become agitated and run or scream, you may give the dog more confidence, or worse, you may appear threatening to the dog. You do not want to be in either of these situations. If an aggressive dog approaches, stand still with your hands at your sides, like a tree, and do not look him in the eyes. In most cases the dog will lose interest and walk away. • Don’t wave your arms about or kick out with your legs as the dog may see these actions as threatening. • Don’t make eye contact as this may cause the dog to lunge. • Stand sideways to the dog and keep him in your peripheral vision. This will signal to the dog that you’re not a threat. • Don’t open your hands and arms up to a bite by extending them. Keep your fingers curled into fists to avoid getting them bitten. Trying to run away might awaken the dog’s prey instinct to chase and catch animals. Therefore, he may pursue you, even if his initial intent was just playful. You will not be able to outrun most dogs, so it’s not really worth the effort. 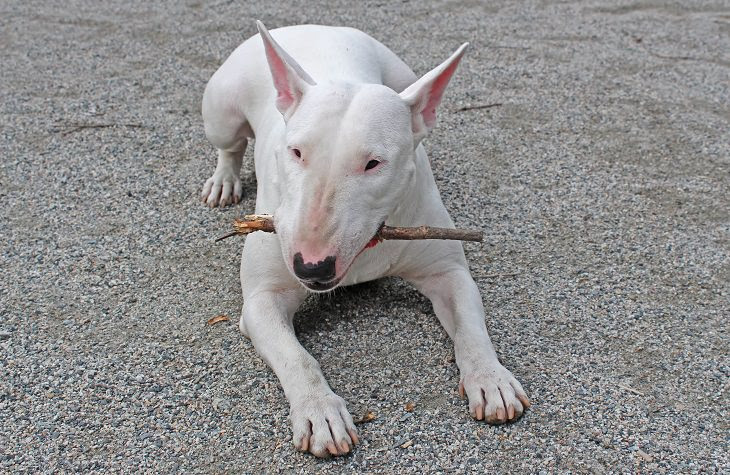 If the dog continues to show threatening behavior towards you, offer him something to chew on, such as a water bottle, your backpack, a nearby stick, or a ball – better this than your arm or leg. This might distract him for long enough to enable you to make your getaway. • You may want to carry some dog treats or toys if you’re traveling in areas that are known for dangerous dogs. If approached by an aggressive dog, throw the treat or food away from you. If the dog continues to be aggressive, your pacifying attempt has not worked, face him and sternly command him to leave. • Use a strong, deep, and commanding voice. If the dog lunges and starts to bite you, you’ve obviously got to defend yourself. To do this, try to kick the dog in the nose, throat, and the back of the head. This will stun the dog and give you time to escape. • It’s okay to raise your voice at this point. Yell for help as you’re fighting back as other people will hopefully come to your aid. However, it’s best to avoid screaming as this may lead to the dog becoming more aggressive. • If you have a stick or something else you can use as a weapon, you should use it to hit the dog. Don’t hit the dog over the top of the head though, as dogs have thick skulls, so this will just make the dog angrier. • Fight as though your life depends on it, because it does – dog attacks can be fatal. Bring your entire body weight down on the dog, pushing down with the hard parts of your knees and elbows. 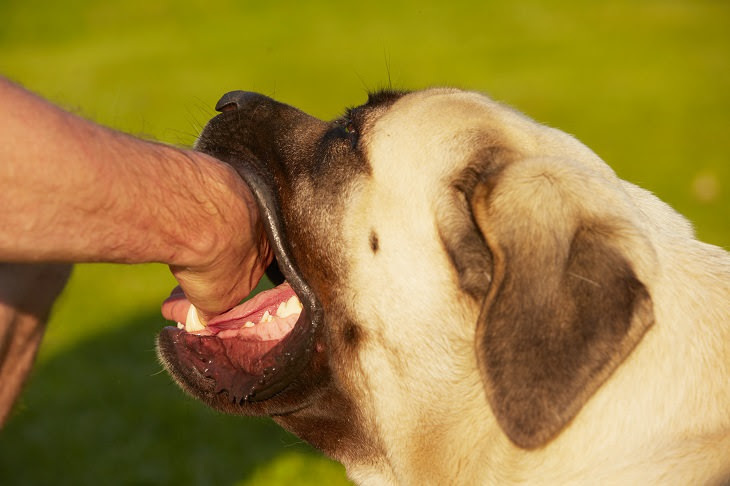 Dogs have a vicious bite, but they cannot wrestle, so try to get into an advantageous position quickly so you can try to break some bones with your weight. If you want to use a more humane method, straddle the back of the dog with your body weight and apply forward pressure to the back of the neck. This will keep the dog immobilized until help arrives. If you get knocked to the ground during the attack, not only will it be more difficult to fight the aggressive dog, but vital areas such as your torso, neck, and head will be more open to attack. These are the most important parts of your body to protect as bites in these places can cause serious damage, and even death. • Protect your vitals by rolling onto your stomach, tucking your knees in, and bring your hands (balled into fists) up to your ears. If the dog loses interest in you, leave the area slowly by backing away without sudden movements. Staying calm in a situation like this is easier said than done, but it’s the best thing to do so long as the dog isn’t biting you. If you have been bitten, promptly take yourself to the hospital! Don't take any chances! 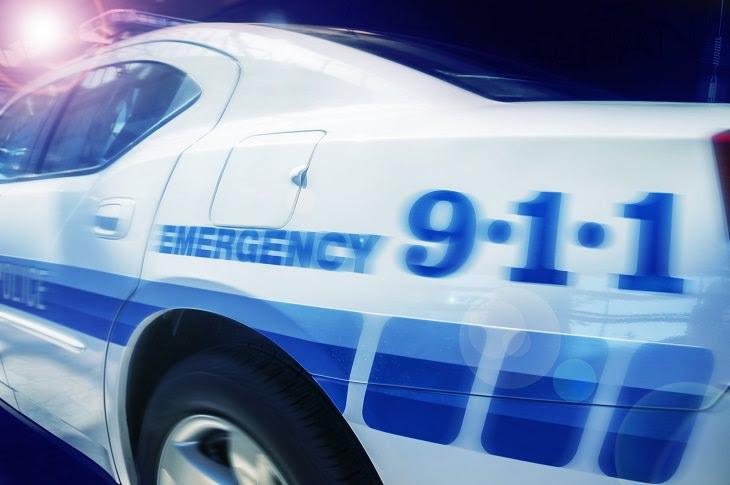 However, if you aren't able to or need to wait for an ambulance, take care of any wounds, as even minor bites can cause infections. • Apply gentle pressure to stop any minor bleeding. Use a clean cloth or sterile gauze pad. If the bleeding is serious and you can’t get it to stop, seek medical assistance immediately. • Wash the wound thoroughly with warm water and soap. • Dress the wound using a sterile band-aid for small cuts or sterile bandages for larger lacerations. • Keep a close lookout for any signs of infections, such as redness, tenderness, warmth, or oozing pus. If you get any of these symptoms, it’s best to go see your doctor. It’s very important to determine whether the dog that attacked you has rabies or a history of aggression. Call the authorities immediately after a dog attack so that the dog can be prevented from attacking anyone else, and can be tested for diseases. • If the dog that attacked you was a stray, he may attack others, too. Removing him from the environment will protect yourself and others. • For dogs with their owners nearby, how you handle the situation after the attack is entirely down to you. For example, if you’ve been hurt you might feel like taking legal actions. If you have been bitten by an unknown dog, a dog that was later found to have rabies, or a dog that seemed to be foaming at the mouth, it’s crucial that you visit your doctor straight away to get some preventative treatment for the deadly rabies disease. • The rabies shot sequence, if necessary, should be started as soon as possible after the bite. • If you haven’t had a tetanus shot in over 5 years, you might be required to have one. • Any significant wound from a dog attack needs to be examined by a medical professional. Most dogs are not aggressive, but are just curious or defending what they think is their territory. Therefore, to avoid unnecessary conflict, it’s vital that you know how to tell if a dog is just playing or is being truly aggressive. Here are some common signs of aggression that you should keep an eye out for. • Growling, snarling, and teeth baring are all obvious signs of aggression and should be treated as such. • An angry dog may show the whites of their eyes. • Pulled back ears lying flat against the head is a telltale sign of aggression. • A dog who looks tense, straight, and stiff (head, shoulders, and hips aligned) could mean business. Most dog attacks come about because of poor containment of the dog, poor training, or taunting. Unfortunately, there will always be bad dog owners about, so it’s best to be prepared. Common sense should tell you not to aggravate any animal. 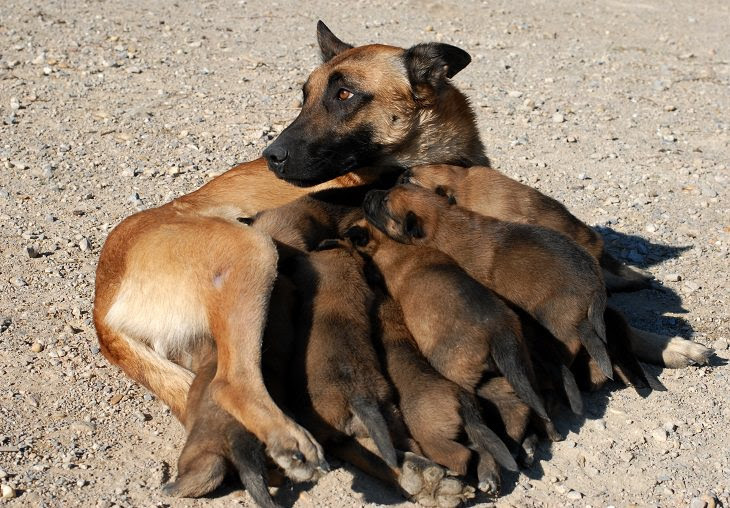 • Never annoy a dog who’s eating or caring for puppies as they are extra-protective during these times. • Avoid smiling at the dog. You may think that you’re being friendly, but an aggressive dog sees you baring your teeth for a fight. • Dogs that have been chained to stationary objects for long periods of time are more likely to be aggressive, so don’t approach them. In general, the best policy to follow when it comes to dog attacks is to do everything you can to avoid them in the first place. If you see a dog that looks dangerous, just stay away. • Report any dangerous-looking dogs to the local authorities. • Teach your children not to approach unfamiliar dogs. • Give all unknown dogs a wide berth until you are sure that they are safe. Remember: Dogs are not naturally inclined to attack humans unless they feel that themselves, their territory, or their pack is under threat. We will not always be able to avoid aggressive dogs, but by arming ourselves with this knowledge, we will be better prepared to prevent a dodgy situation from escalating, minimalizing the damage if a dog does decide to attack.